John Flanagan (1865-1952) of New York was a medalist who also studied under St. Gaudens. He produced several medals and sculptures. His most famous work is the Washington Quarter first produced in 1932 to commemorate the 200’th anniversary of George Washington’s birth. The choice of Flanagan’s design was controversial because the Commission of Fine Arts and the Washington Bicentennial Commission chose Laura Frasier’s design as being far superior to all the 100 entries in a competition. Super rich financier and Treasury Secretary Andrew Melon pushed through his choice and America had a new quarter in 1932. It is said Melon’s choice was made not for artistic reasons but because he was a male chauvinist. Astute readers may recognize the name Frasier in the context of coin design. Laura Gardin Frasier was the wife James Earle Frasier who designed of the Buffalo Nickel. A more recent Commission of Fine Arts chose Laura Frasier artistic design to grace the 1999 $5 Gold coin that commemorates the 200’th anniversary of Washington’s death. James Barton Longacre (1794 – 1869) was born and died in Pennsylvania. Longacre was chief engraver for the U.S. Mint from 1844 until his death. Longacre’s most famous design is the Indian Head Cent. He also designed the Flying Eagle Cent (influenced by Gobrecht), two cent piece, three cent nickel, shield nickel, $1 Liberty Head, $1 and $3 Indian Princess and the $20 Liberty Double Eagle. He also designed many patterns and coins for both the U.S. and other countries. The future creator of the Winged Head Liberty Dime and the Walking Liberty Half Dollar was born December 11, 1870 to Gustave Weingaertner, a shoemaker, and his wife Katharina.1 He left his native Karlsruhe, Germany in 1880 at the age of ten to live in America with a relative in the grocery trade. Some time after his arrival in the United States, he simplified his name to Weinman, a practice continued by his descendants. A precocious talent for drawing and modeling in clay led the 15-year-old Weinman to an apprenticeship with Frederick Kaldenberg. This indenture was for five years, during which time he carved utilitarian objects such as mirror frames and smoking pipes out of wood and ivory. Although he no doubt sought the life of an artist rather than an artisan, young Weinman dutifully fulfilled his obligation to Kaldenberg. One year into his training, however, he enrolled in New York City’s legendary Cooper Union for the Advancement of Science and Art. There, and at the Art Students League, he studied drawing. Upon leaving Kaldenberg’s workshop at age 20, he joined the studio of medallist Philip Martiny.2 With this initial exposure to the medallic art, Weinman was inspired to make this his life’s work. His reputation under Martiny was evidently enough to secure for him the position of assistant director in the studio of Olin H. Warner. The year was 1895, and the sculptor was then just 25. Warner’s premature death less than a year later prompted another move to the studio of Augustus Saint-Gaudens. The Dublin-born Saint-Gaudens was just then achieving the status of America’s pre-eminent sculptor, and this step in Weinman’s career was a prestigious one. It too was cut short, however, with the elder artist’s decision to remove himself to Paris in 1898. Returning just a few years later, Saint-Gaudens would ultimately design the United States eagle and double eagle of 1907. Sadly, he would not live to see his work coined, nor would he bear witness to his disciple’s rendering of the dime and half dollar in 1916. Following Saint-Gaudens’ departure for France, Weinman joined the studio of Charles H. Neihaus for five years. Neihaus was likewise an accomplished medallist, though not of the stature of Saint-Gaudens. Having paid his dues as student and assistant to others, Adolph A. Weinman went into partnership with Daniel Chester French, another sculptor of renown. French would later go on to have several connections to United States coinage, most of them indirect. In addition to serving on the Commission of Fine Arts, which oversaw the selection of coin designs, adaptations of his work appear on two USA coins. His seated figure of Abraham Lincoln for Washington’s Lincoln Memorial appears in extreme miniature on the reverse of the cents coined since 1959. The half dollar commemorating the sesquicentennial of the battles of Lexington and Concord features his portrayal of the Continental Minuteman. Both coins were executed by other sculptors. Weinman’s partnership with French came to an end after some two years, at which time he resolved to open his own studio. Among his first commissions was the award medal for participants in the Louisiana Purchase Exposition held at St. Louis in 1904. The many examples of this medal were coined at the Philadelphia Mint, and the reverse of his design is somewhat suggestive of his later reverse for the half dollar. It’s not known whether Weinman’s efforts ran afoul of the Mint’s defensive Chief Engraver, Charles E. Barber, but he was no doubt treading on safer ground in the field of medals rather than coins. Adolph Weinman’s only other connection to the Mint before 1916 was in his 1905 collaboration with Saint-Gaudens on the inaugural medal for President Theodore Roosevelt. Roosevelt was a great admirer of the elder sculptor, and high hopes were placed on this private commission. The frail Saint-Gaudens, his mind still alive with ideas, drew on his former assistant Weinman to do the actual modeling.3 In opting to portray the president in the style of the great Renaissance medallists, Saint-Gaudens achieved an effect far bolder than that of Barber and George T. Morgan in their officially sanctioned medal for the same occasion. The partnership of Saint-Gaudens’ grand vision and Weinman’s talented hands made for an artistic triumph. 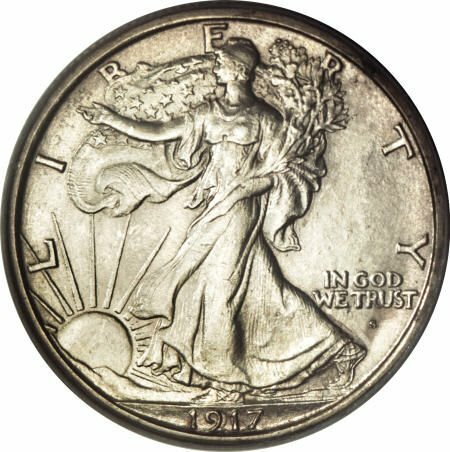 At the suggestion of the Commission of Fine Arts, Adolph A. Weinman was one of three sculptors invited to submit designs for a new dime, quarter dollar and half dollar in 1916. His entries were selected for the smallest and largest coins, while those of Hermon A. MacNeil were to appear on the quarter. The obverse figures for both of Weinman’s coins were derived in part from the bust of Elsie Kachel Stevens that he executed around 1913. Her features appear in closeup on the dime and in miniature as part of a full figure on the half dollar. After many trials and tribulations, the finished coins entered circulation in October 1916 and January 1917, respectively. Despite their popularity with collectors, both coins would succumb within two years of one another to a changing taste in art and to the exigencies of politics. The dime was discontinued after 1945, the half dollar after 1947. The obverse of Weinman’s half dollar was revived in 1986 for the United States Mint’s silver one-ounce bullion coin and thus remains current. Other notable works by A. A. Weinman include monuments to Abraham Lincoln at Hodgenville, Kentucky and Madison, Wisconsin.4 His “Fountains of the Tritons” decorates the grounds of the state capitol at Jefferson, Missouri, while a statue of Major General Alexander Macomb stands in Detroit. The Museum of the City of New York was graced with his statues of Alexander Hamilton and DeWitt Clinton. Weinman created two allegorical scenes for the 1915 Panama-Pacific International Exposition titled “The Rising Sun” and “The Descending Night.”5 Numerous other works of monumental sculpture bear his signature, as well. Further medallic works include a World War I commemorative for the staff of New York’s Mt. Sinai Hospital and the J. Sanford Saltus Award for Medallic Art, a tribute bestowed by the American Numismatic Society. Fittingly, Weinman himself received this award in 1920. Other recipients whose names will be familiar to students of United States coinage include Victor D. Brenner, James Earle Fraser, John Flanagan and Hermon A. MacNeil.7 Among Weinman’s most widely disseminated works is the Victory Button, presented to all veterans of World War 1. Adolph A. Weinman died on August 7, 1952, five years after the last of his coins had been superseded by more modernistic designs. Able to look back over a lifetime of remarkable achievements in the art of sculpture, it’s doubtful that he experienced much regret at the passing of his coins from production. In any event, both pieces remained abundantly familiar in circulation for some years following his death. Today, they enrich the cabinets of numismatists worldwide. 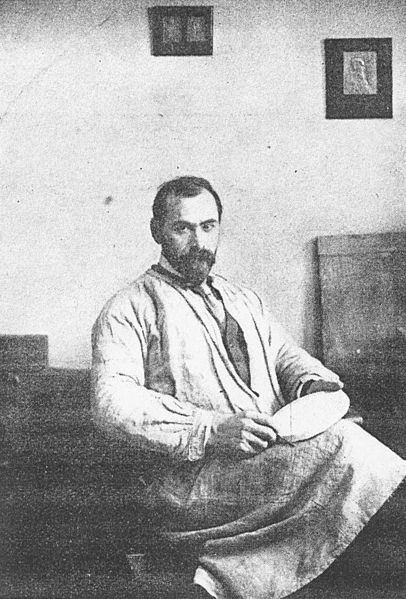 Victor David Brenner born as Viktoras Barnauskas (June 12, 1871 – April 5, 1924) was an Lithuanian-American sculptor, engraver, and medalist known primarily as the designer of the United States Lincoln Cent. Brenner was born to Jewish parents in Siauliai Lithuania. His Lithuanian name at birth was Viktoras Barnauskas, but he changed the name to Victor David Brenner, because it was easier to get the American citizenship. He emigrated to the United States in 1890, living mostly in the New York City area. When Brenner arrived in America, he had little more to fall back upon than the muscle and brawn of youth, his industry, and the well-learned trade taught him by his father — gem and seal engraving. This was an excellent technical preparation for his present skill with the tools of the sculptor’s craft. He studied art at Cooper Unionin the night classes there. Brenner soon mastered English as he had mastered French. Eight years later Brenner was in Paris, studying with the great French medalist, Oscar Rotv at the Academia Julian. There he exhibited his own work and he obtained awards at the Paris Exposition of 1900. Eventually, he returned to the United States, and from that time on, his career was a series of successes, and he appeared to be on his way to the fulfillment of the splendid predictions made for his future by Rodin. The Lincoln Cent, showing placement of the initials of Victor David Brenner from 1918 onward. Brenner is probably best-known for his enduring Lincoln coin design, the obverse of which is the longest-running design in United Stated Mint history. Brenner’s design had been picked by 26th US President, Theodore Roosevelt, who had earlier posed for him in New York. Since arriving 19 years earlier in the United States, Brenner had become one of the nation’s premier medalists. Roosevelt had learned of Brenner’s talents in a settlement house on New York City’s Lower East Side and was immediately impressed with a bas-relief that Brenner had made of Lincoln, based on the early Civil War era photographer,Mathew Brady’s photograph. Roosevelt, who considered Lincoln the savior of the Union, the greatest Republican President and also considered himself Lincoln’s political heir, ordered the new Lincoln penny to be based on Brenner’s work and that it be produced to commemorate Lincoln’s 100th birthday in 1909. The likeness of President Lincoln on the obverse of the coin is an adaptation of a plaque Brenner executed several years earlier and which had come to the attention of President Roosevelt in New York. Bronze bas-reliefs dated 1907 and signed by Brenner have been identified and some sold in auctions for as much as $3,900. Charles Eliot Norton of Harvard, whom Brenner counted among his friends, gave the sculptor an unpublished portrait of Lincoln which served Brenner as a basis for the study of Lincoln’s features. However, he examined every portrait to which he was able to obtain access, in order to draw those conclusions that, together with conversations with those who had known Lincoln himself, enabled him to evolve the portrait that appears on the penny. When Brenner forwarded the model of the Lincoln cent to the Director of the Mint, the design bore his whole name, after the fashion of the signatures on the coinage of other countries, notably on the gold coins which Oscar Roty designed for France. The Director, however, decided to have the initials substituted for the name, and in so doing he was thoroughly aware that in retaining either name or initials he exercised the prerogative of his office, as the law definitely gives him decision in such matters. So, following the precedent of James B.Longacre, whose initials “JBL” (or simply “L”) graced a number of U.S. coin designs for much of the latter half of the 19th century, Brenner placed his initials “VDB” at the bottom of the reverse between the wheat ear stalks. Brenner at first refused to sign either his name or his initials, and his subsequent decision to permit the latter to appear was due entirely to his sense of responsibility for his work.